A compact body, built-in Wi-Fi, and fast print speeds make the Ricoh SP 201NW black and white Wi-Fi desktop laser printer a reliable and efficient printer for the small office that would like a cost-effective and environmentally friendly way to improve their productivity while minimising running costs. The Ricoh SP201NW mono laser printer is user-friendly and versatile, but the lack of further expandability and upgrades are downsides to the growing workgroup. This is a 6.8kg machine with an understated and industrial frame that measures 402mm wide, 165mm tall, and 360mm deep. 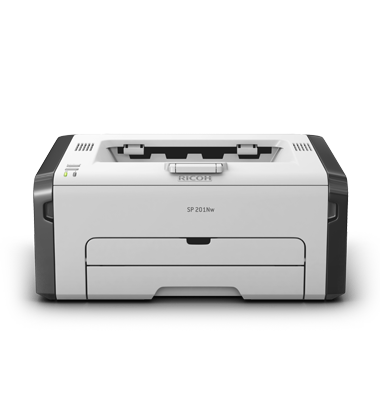 The Ricoh SP 201NW WI-Fi printer runs on 32MB of RAM and is powered by a PA-20 66MHz CPU. It uses laser print technology with an all-in-one Ricoh SP 201NW black toner. Wi-Fi, Ethernet, and USB 2.0 are the standard interfaces. The output bin can handle up to 50 sheets. It's quiet and efficiently produces sharp monochrome results in speeds of up to 23ppm. Wi-Fi is standard, and Ad hoc is supported. The Ricoh SP 201NW has a compact size, which saves space. The fast 25-second warm up time and 10-second first print improves productivity and reduces downtime. The paper trays of the Ricoh SP 201NW black and white laser printer are adjustable for handling different media sizes. A web status monitor software is included. Toner saving modes and the AIO Ricoh SP201NW cartridge keep printing costs and maintenance to a minimum. The Ricoh SP201NW doesn't print in colour. Its memory and paper capacity are not upgradeable. Duplexing is manual, and media capability of the Ricoh SP 201NW is quite limited. It's only compatible with Windows operating systems.